The West Yorkshire Combined Authority’s CityConnect project has expanded its range of sessions and courses for people across the county. 500 sessions have already been delivered to help people make their first commute to work, increase their cycling skills and confidence or learn to ride for the first time. Courses are available in every district in West Yorkshire and are funded by the West Yorkshire Combined Authority. “On average, we’re stuck in traffic for 31 hours a year, which costs the country £37.7 billion in lost productivity, contributing to poor air quality, which costs £27.5 billion a year,” commented Cllr Keith Wakefield, chair of the Transport Committee. Through CityConnect, the Combined Authority is also helping jobseekers access employment and training through cycling, with 50 jobseekers having already received bikes to help them find work. Apprentices are also able to get a bike through the scheme and are all supported by free cycle training courses. CityConnect is open until the end of summer this year, with limited spaces available. 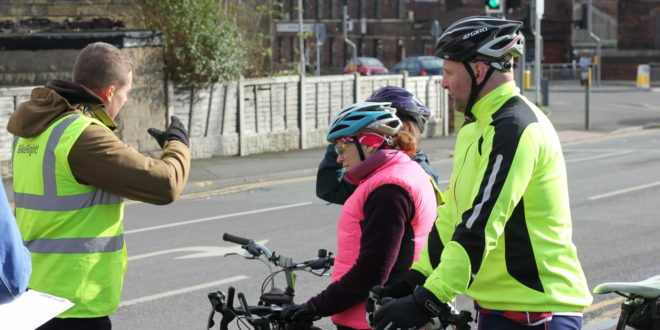 The training is delivered in partnership with Sustrans, the walking and cycling charity and BikeRight!, who trains 20,000 adults and children a year. Stephanie, a recipient of a bike from a Batley session, said: “I heard about this through word of mouth in the community hall. I always rode a bike when I was small, but the last time I got on a bike was around 10 years ago so I’m not really road savvy. When this opportunity came up I jumped at the chance.